"Now you see what I see." 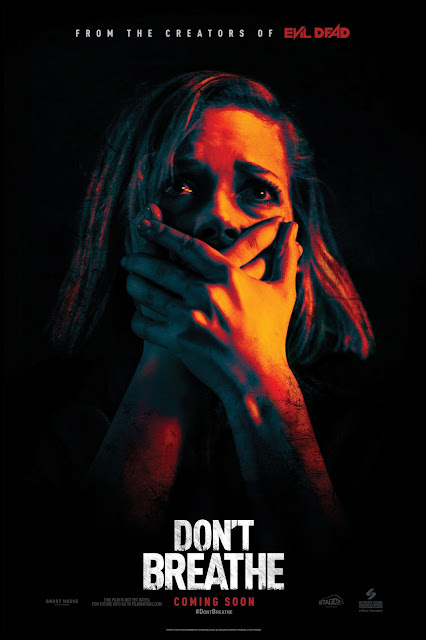 That's a distrubingly terrifying quote from Stephen Lang in Don't Breathe, an absolutely tense, brutal, & unforgiving thriller. Lang portrays Norman Nordstrom, a blind war veteran from Detroit, who is still grieving from the death of his daughter after being hit by a car, with the driver being set free after her rich family from Grosse Pointe paid a large sum of money to him. Meanwhile, three delinquent teens: Rocky (played by Jane Levy); Alex (played by Dylan Minnette); & Money (played by Daniel Zovatto) decide to rob Nordstrom's house for the money. The three have robbed countless houses in order to fund Rocky's move to California with her younger sister in order to get away from her abusive & neglectful mother & her alcoholic boyfriend. After some reluctance from Alex, they agree to rob the house. However, when they go to rob the house, it completely goes awry; Nordstrom kills Money, & now, Rocky & Alex must find a way out & try to avoid Nordstrom. Lang, Levy & Minnette were excellent. The direction from Fede Alvarez is excellent, along with the screenplay from Alvarez & Rodo Sagayues. The editing from Eric L. Beason, Louise Ford & Gardner Gould is great. The cinematography from Pedro Luque is brilliant. And the plot twist is one of the greatest in film history. This is a brilliant thriller, & is one of the best films of the year so far.